A Better, Sexier TV Show Version of "Twilight"
Junior Amanda Brisco scored the only goal in a 1-0 win over Colby. The Jeffs face Bowdoin in the NESCAC semifinals on Saturday at Williams. 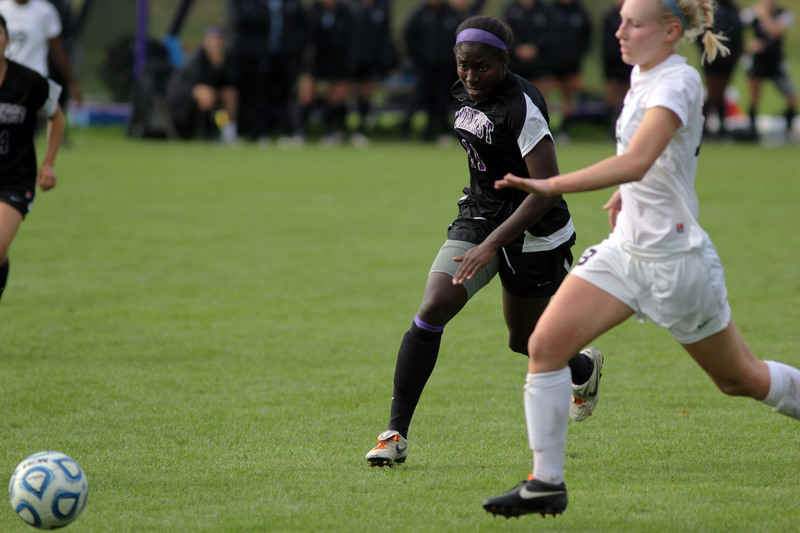 The women’s soccer team kept their season alive with a 1-0 victory over 6th seeded Colby in the NESCAC quarterfinals. Previously, the College defeated Connecticut College 2-1 to finish in a three-way tie atop the NESCAC regular season standings. Having lost the tiebreakers to both teams, however, the Jeffs garnered the third seed in the conference championship. In the Wednesday, Oct. 24 game against Conn. College, Kathryn Nathan ’13 and Megan Kim ’16 scored first half goals to lead Jeffs to a 2-1 victory. Captain Nathan scored in just the 10th minute, finish a pass from co-captain Kate Sisk ’14. First-year sensation Megan Kim ’16 doubled the College’s advantage in the 21st minute, striking a shot off the crossbar that bounced across the line for a goal. In Saturday’s NESCAC playoff opener against Colby, the Jeffs controlled possession for much of the first half but were unable to capitalize on their opportunities. Perhaps their best chance came when Nathan found Chloe McKenzie ’14 at the top of the box. McKenzie ripped a shot off Mules goalkeeper then was denied a rebound opportunity when the goalkeeper made a sensational sprawling save. The Jeffs almost scored just seconds before halftime but their goal was waved off by the referee’s whistle. Coming out firing, the Jeffs finally broke through in the 54th minute when Nathan sent a long lead pass to Hannah Cooper ’14. Cooper held off the Colby defender and laid off a ball for Amanda Brisco ’14. Brisco scored from 15 yards out to give the Jeffs the decisive goal. Colby threatened, particualry in the 88th minute, but first-year goalkeeper Holly Burwick made a diving save to make Brisco’s goal stand. The Jeffs next travel to Williams to take on the fourth-seeded Bowdoin Polar Bears. In the other semifinal, second-seeded Williams will face eight-seed Wesleyan, who shocked top-seeded Middlebury last weekend in the quarters. Nathan was looking forward to the weekend and believed efficiency would be the key to victory. “In order to be successful this weekend, we must treat every scoring opportunity like it is the only one we will have all game. We need to be focused and ready to finish our chances when we have them. Hopefully, the weekend will end hoisting the NESCAC Championship trophy on rival Williams’ home field. For the Jeffs, nothing would be sweeter.